The Golden-winged Warbler (Vermivora chrysoptera) is a North American Neotropical migratory bird in the family Parulidae that breeds primarily in the United States and overwinters on the Osa Peninsula from approximately October through March. It is the first in our series of migratory birds that we will be presenting in the weeks leading up to the first annual International Migratory Bird Day Festival being held in Puerto Jimenez on March 1, 2014. It is the first in a series primarily because it is a species that has undergone one of the steepest declines of any songbird in the last half century. They are considered to be near-threatened by the IUCN. 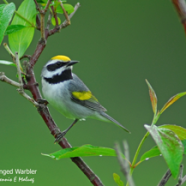 Golden-winged Warblers breed in shrubby habitat moving into woodland areas when their chicks have the left the nest. While they are here on the Osa they are fairly rare but can be found in open woodland areas and secondary growth. The highest density of Golden-winged Warblers can be found in the state of Minnesota, accounting for about half of the entire population. We are making conservation efforts towards the protection of this species. For more information on the Golden-winged Warbler visit allaboutbirds.org. You can also visit our festival Facebook page for a look at photographs, art and information on a new migratory bird species each day. La Reinita Alidorada (Vermivora chrysoptera) es una ave migratoria neotropical de la familia Parulidae que reproduce en Norte América y pasa el invierno en la Península de Osa de Costa Rica desde aproximadamente Octubre a Marzo. Es la primera ave en una serie de aves migratorias presentadas aquí en las semanas antes del primer Festival Internacional de Aves Migratorias en Puerto Jiménez el 1 de Marzo, 2014. Es la primera en la serie porque es una de las especies de reinita mas en peligro y amenazada según la Unión Internacional para la Conservación de la Naturaleza. La Reinita Alidorada reproduce en matorral y llevan sus crías cuando salen del nido a áreas boscosos para protegerlas. Mientras están aquí en la Osa habitan bosque abierto y vegetación secundaria. La densidad mas alta, y la mitad de la población global de la Reinita Alidorada se encuentra solamente en el estado de Minnesota. Por eso estamos enfocado en promover el conocimiento de la Reinita para poder proteger la especie y conservar su hábitat invernal, uno de los hábitats mas importantes para todas las aves migratorias que están aquí. Para mas información sobre esta especie y otras visite allaboutbirds.org. También puede visitar nuestra pagina de Facebook para disfrutar de la fotografía, arte, y información sobre una ave migratoria diferente cada dia.